Speakers at a demonstration against South Africa participation in the Davis Cup tennis tournament that was held at Vanderbilt University in Nashville, Tennessee, March 1978. 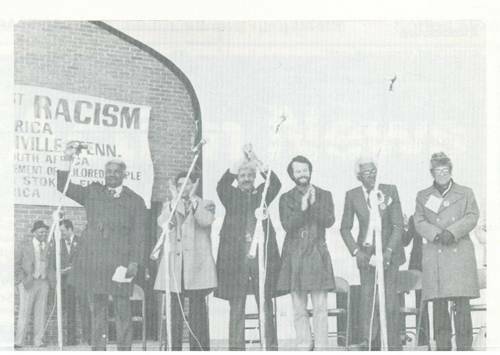 The two speakers in the center are American Committee on Africa President William H. Booth and Richard Lapchick, National Chairperson of the American Coordinating Committee for Equality in Sport and Society (ACCESS). ACCESS was a sponsor of the event. Photo reproduced from ACOA Action News.